So, it's been a few weeks since I started on the 'Thinking Slimmer' focus group. I thought I would catch you up, on how things are going. Am I noticing changes? Well, yes, actually. Every day I note down 3 positive changes, that I've noticed. I've yet to struggle to find them. It's the little things, like, I'm not snacking between meals. It doesn't occur to me, because I'm not hungry. I've not given the Easter chocolate the battering I normally would. Yes, I've realised I'm lactose intolerant, but it's more than that. It's not calling me from the fridge, it's forgotten my name. My sweet tooth is lessening, every day. I'm enjoying the food I do eat, a lot more. All food. I'm enjoying my fruit and veg, like it's a real treat. I'm not saying I'm perfect, but for the first time in my life, I don't feel like I'm on a diet. So when I do make a cake/dessert, I enjoy it, guilt free. Thin people enjoy cake! I'm not noticing any major changes to my weight or shape right now, but it is only week 3, so I'm giving it time. The most important thing, is that I'm not giving up! I don't feel like I'm on a diet, so there is nothing to give up on. Hopefully, as the weather is getting nicer, my steps will go up. Being back on the school run will help with that too. I'm keeping my hopes up, because the one thing I have noticed, as far as my weight goes, is that I haven't gained. That NEVER happens, when I don't log my food. For the first time, for those that don't know me, I'm sharing a full body pic. 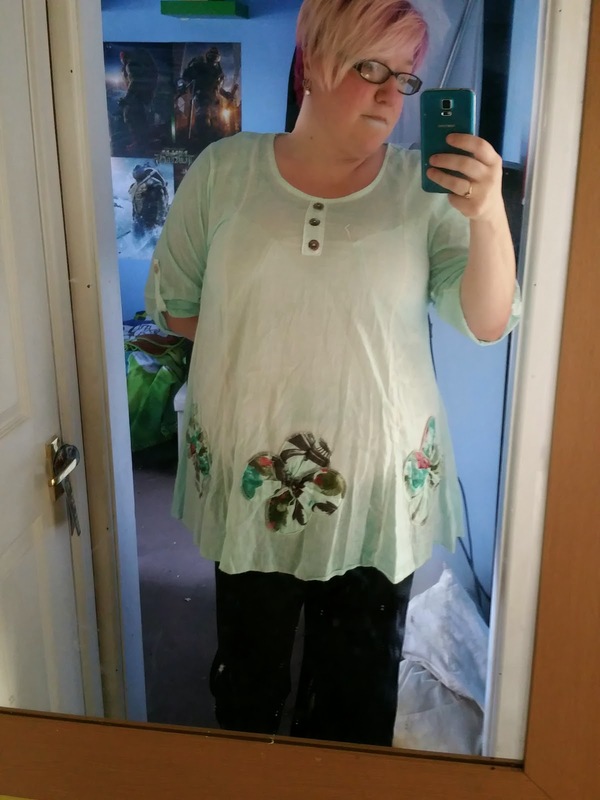 I do have pictures that show my shape more accurately, but I'm not ready to share those yet! Thanks for your support on my journey. I am determined that something has to work, and I really want it to be this! It sounds like you are doing really well!